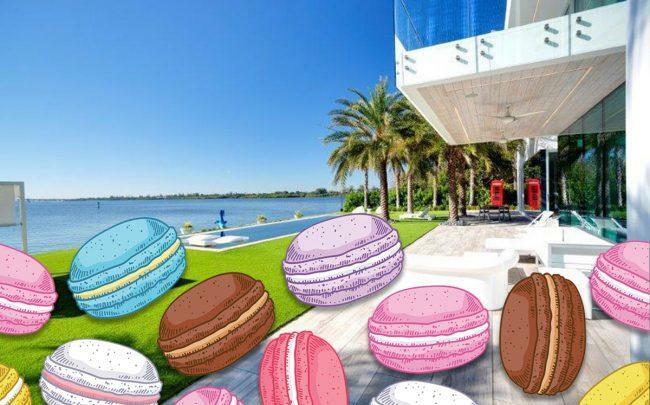 The owners of the french pastry shop Le Macaron in Palm Beach sold a waterfront spec home in the wealthy town for $6.8 million. Jason and Natasha Rawding sold the 5,076-square-foot home at 2299 Ibis Isle Road for $1,339 per square foot, records show. The trust of Stephen and Joy Hall bought the home. The Rawdings acquired the property in 2017 and built the home in 2018. It has six bedrooms, six bathrooms and 315 feet of total water frontage, along with a guest house and a boat lift. The house was previously listed for $7.9 million in December by Jim McCann of Premier Estate Properties. The buyer was represented by Arno De Vos of Douglas Elliman. The Rawdings own two Le Macarons, at 302 South County Road in Palm Beach and at CityPlace in West Palm Beach. The french pastry shop was founded in 2009 and started franchising in 2012. With only a few spec homes built in Palm Beach, new houses usually sell quickly for high asking prices. In February, Malasky Homes sold a 5,769-square-foot home at 608 Island Drive for about $2,695 per square foot. BuyBuy Baby founders Richard Feinstein and Jeffrey Feinstein paid $21 million for a spec home at 488 Island Drive on Everglades Island.